Choosing the proper solar lantern for camping can make or break how well you enjoy your next camping trip. Whether you’re looking for a lantern to use around the campsite, set up your tent, or merely read when it’s time for bed, there’s a solar lantern that will fit your needs. When choosing a lantern, you have to make a decision based on what type of camping you’ll be doing, what you plan to use the lantern for, and how durable of a lantern will you need. Water resistance, weight, battery life, recharge time, and size are all crucial things to consider. While many lanterns advertise that they are for camping, that doesn’t always mean that they’ll be lightweight or waterproof. Up to 4-hours battery life, 15-20-hour solar charging time. Up to 12-hours battery life, 6-7-hour solar charging time. Up to 15-hours battery life, 4-6-hour solar charging time. Up to 24-hours battery life, 7-hours solar charging time. Dual charging method, built-in hook for hanging in tents or on backpacks. Warm light mode, short solar charging time. Inflatable, completely waterproof, lightest possible weight. What considerations are important when choosing a solar lantern? Q: What if the weather will be cloudy? Q: Does weather resistance really matter? Q: Why can’t I just use a headlamp? Q: Are battery powered lanterns better? The Spright Solar USB Lantern comes in as our number one pick due to its simplicity and ease of use. The Spright Solar USB Lantern is a versatile lantern thanks to it having two different methods of charging. You can place this lantern indirect sunlight to charge through the day and have a great lantern by night, oryou can plug it in via USB and have it fully charged in just a couple of hours.Being able to charge the lantern via USB is a great backup just in case you forget to set it out in the sun before use! Another great feature of this lantern is that it’s made of a collapsible silicone material that is both lightweight and glow-in-the-dark. This makes it an excellent choice for minimalist backpacking trips that will still require you to have a lantern. Considering its features,camping will be a breeze with the UST Solar Lantern. It features a hook to hang the lantern in your tent for reading and getting ready to sleep for the night. This lantern is also waterproof, making it great if you plan to kayak or canoe to your campsite, or if you know rain is on the forecast. All in all, you can’t go wrong with the UST Solar USB Camping Lantern. The AGPTEK Solar Lantern is a fantastic choice for car camping or home emergencies such as power outages. If you’re planning ahead fora camping trip, you can charge the lantern via the USB port. This allows fast charging to assure your lantern will be ready for use before your next big trip. Solar power is another excellent way to charge, as you can place it in direct sunlight during the day,and in 6–7 hours you’ll know your lantern will be ready for use, with no electrical outlet needed. Although this lantern requires very little energy to use, there may be times that you need to use it for an extended period of time. If your lantern battery dies once the sun has set and you don’t have a power source, it features a hand crank that will allow charging with no power or solar light required! Five-minutes of cranking will generate around one-hour of battery charge. You can also install AAA batteries if you have them available! One feature of this lantern that is unique to many of its kind is the USB charging port. Separate from the port that you would use to charge the lantern, there is another on the base that can be used to charge other devices such as phones or tablets! Solar-charge time is a breeze with this lantern. As many solar powered lights take almost a full day to charge, the AGPTEK Solar Lantern charges in only 6-7 hours in direct sunlight! 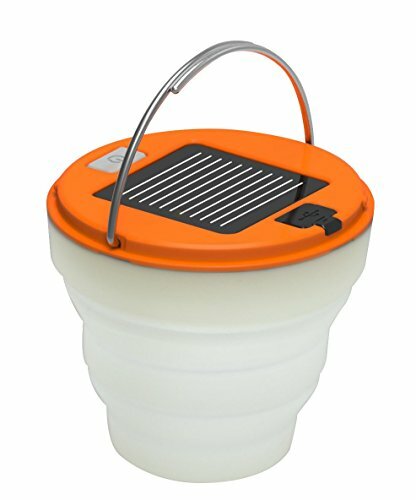 The Odoland USB Rechargeable Solar Lantern comes in as the best under $20 due to its unique features that are comparable to more expensive lanterns. As many solar lanterns have multiple different brightness levels, this lantern has both brightness levels and warmth levels. This feature makes this lantern an excellent choice as it is easy on the eyes, literally. 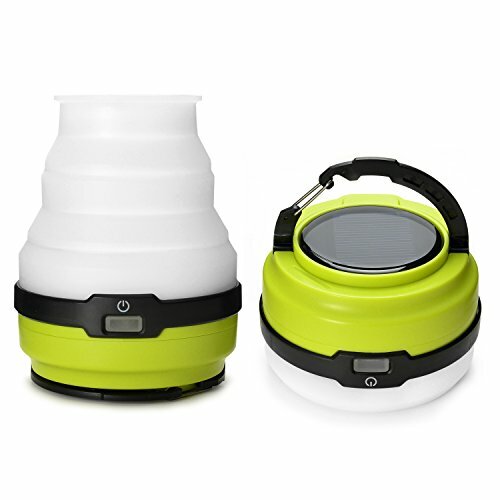 The Odoland USB Rechargeable Solar Lantern has two separate ways to charge the lantern, USB and solar. This is especially helpful on long drives to the campsite. You can charge it on the way via USB car charger, and the next day you can set the lantern in the sun and have a fully charged lantern by nightfall. One significant advantage that this lantern has over many, although only emitting 20 lumens on low warm mode, it will retain its battery life for 20+ hours! This makes it an excellent light to hang in your tent! The Odoland Lantern is waterproof, weighs 6.4 oz, and has an excellent battery life, making it an excellent option for backpackers and campers looking for a lantern under $20. 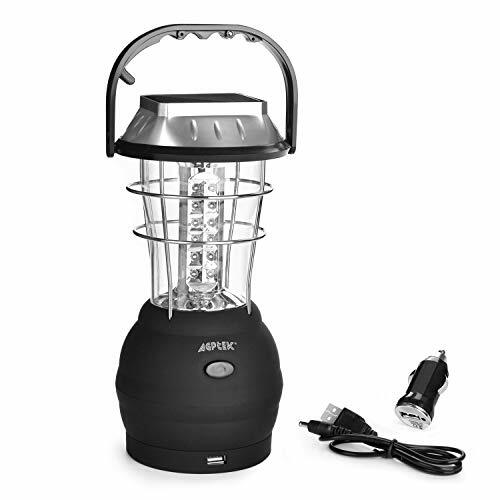 In addition to these features, this lantern only takes 4-6 hours to charge in direct sunlight. The MPOWERED Luci Light is by far one of the most unique solar lanterns on the market as it is inflatable. This allows for exceptional packability and unsurpassed weather resistance. While many waterproof lanterns are more “water resistant” than they are waterproof,the Luci Light is completely submersible. These features alone make this light a perfect choice for minimalist camping, backpacking, or any kind of water sports in which you would need a lantern. The Luci Light weighs only 4.4oz, making it the lightest lantern in this list. The only drawback is that the only charging option is via solar, and you cannot charge external devices with the lantern. This isn’t an issue to many people, but one of your device’s batteries die, you won’t have the ability to recharge using the lantern. Always make sure that you prepare for your trip ahead of time and place your Lucilight indirect sunlight as it takes up to 7 hours to achieve a full charge. On advantage to having an inflatable light is obvious, but many don’t think about it at first. If you plan a trip that involves kayaking, canoeing, or any type of boating, you won’t lose your light if you accidentally drop it in the water, and it remains fully functional if you do! Weather has a major impact on the performance of your lantern. If you choose a lantern that has no weather resistance, you may have issues if you run into some unexpected rain or snow. Even the slightest amount of moisture can damage your solar lantern if it’s not designed to be resistant of the elements. Terrain isn’t as significant of a concern as weather, but it’s still important if you don’t have a way to protect the lantern during transport. If you’re backpacking, there’s a higher chance of the lantern being dropped or bumped while you’re hiking. Typically, a lantern made of silicone or soft plastic will hold up better during falls and drops. Wet conditions are typically different than weather conditions. Many times, when camping you’ll be around rivers or lakes, and even in some cases, you’ll be on a boat for part of the time. If this is the case, you should consider a lantern that’s waterproof just in case it gets dropped in the water. Always remember when choosing a lantern,weather resistant is not submersible. The length of your trip should help you decide what lantern best fits your needs for several reasons.Primarily, battery life and solar charging time are what matter in this case.If you have a one-night trip planned, battery life and charging time are not much of a concern. If you have a week-long backcountry trip planned, this is when it’s most important. For longer trips, make sure that you choose a lantern that has a long battery life with the shortest possible charging time. This will be much more reliable than a lantern with a short battery life. What Type of Camping – Backpacking or Car Camping? The type of camping that you’re doing should be a major consideration when choosing a lantern. For those that plan to camp out of their car, RV, or at least in an area that you park close to, a heavier lantern that has many functions may be great for you. Weight is not a concern in this situation. If you’re planning a backpacking trip, both size and weight are of equal importance. A lantern with a built-in hanger will help save space and make packing a breeze. Always remember when backpacking that you have to carry the lantern on your back, thus, lighter is better. A: It is a common myth that solar lanterns will not charge in cloudy weather. The main difference is that it will cut your charging time by 75-90%, requiring much more time to charge the lantern. A: Always, the only time that it isn’t an issue is if it’s a short trip that only lasts about a day. This way it is much easier to be certain of whether your lantern will get wet due to weather. Always keep the lantern covered at night if not weather resistant,morning dew can cause issues over time. A: You can! Many people only use headlamps, and many people use both. The advantage of the lantern is that the light doesn’t move every time you move. If you’re in a group, lanterns are much more efficient. A: The most direct answer is that it depends on your use and your recourses. Solar lanterns are a more environment friendly option because they produce no waste when the battery dies. You may get a brighter light when using batteries, but the batteries often die faster than a solar lantern. 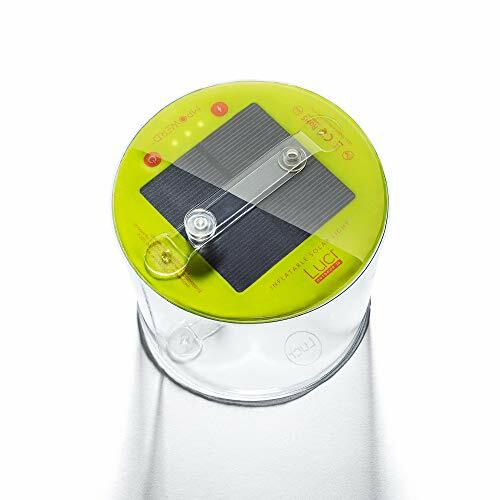 Whether you’re glamping or backpacking, there’s a solar lantern out there to fit your needs. Having a solar lantern is one of the best ways to be efficient, environment friendly, and resourceful all while enjoying the great outdoors. We hope that this guide has helped you understand what to consider when choosing a solar lantern, as well as inform you of some the best ones on the market today.